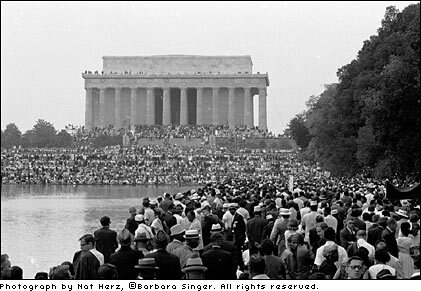 Nat Herz documented, through photographs and words, the first March On Washington on August 28, 1963, the march during which Martin Luther King, Jr. gave his "I Have A Dream" speech. All photographs are 1963 vintage silver halide prints. It was very important to me to photograph inside the March not outside of it. I wanted to be subjectively part of it while objectively viewing it. I wanted to be swept by the heat of the day's changing emotions while coolly composing pictures in my camera's viewfinder. I wanted to relate pictures of single, mysterious individuals to the general throng of gathering thousands, relating the one to the many as is natural in a country with our nation's motto. It was necessary to show the ordinary happenings of people such as eating, napping, day dreaming taking on the extraordinary tones of a day to be looked at by other eyes than ours in time to come. Due to the enormous historical importance and beauty of this book, I am now looking for an agent or publisher who can bring the book to the general public. Please contact me if you have any information. Modern prints are available from Barbara Singer Productions.